This is an amazing product I am on my second tube, I suggest buying the belt with it. It works if you work so dont expect to put it on and it to do magic. You put it on right before a workout and it helps to melt stubborn fat especially cellulite. "Finally! How To Incinerate Your Stubborn Fat Areas"
If you want incinerate fat on the spot, get rid of stubborn belly fat, or even if you just want to get rid of fat under your arms, then this is the most important letter you'll read all year! We all have problem areas with stubborn fat and it is unsightly and frustrating! Our phat cream is by far the best in class. If you have tried other brands before, get ready because phat cream is on another level. It is the most advanced topical fat incinerating system on the market today. Developed specifically for stubborn fat areas. As the name implies One Percent Nutrition was developed for 1%ERS. For people who accept no compromise. For people who demand the best from themselves, everyone and everything around them. For people who don't settle for 2nd best or 2nd place. For people who don't believe in participation trophy. For anyone who is looking for a competitive edge in LIFE. Reap extra rewards from using Phat Cream! A daily application of this topical cream assists your ab definition and helps create the ultimate shredded six-pack. Scientifically-formulated and heat-activated, Phat Cream provides an extra boost to any high-performance diet and exercise program... which empowers you to make the most of your muscles! IF There Was A Real Magic Fat Burning Cream, THIS IS IT! This thing works wonders!! you feel it 5 minutes after putting it on! and it really makes you sweat so much more!! !I remember putting on a dry grey shirt and working out then doing the same thing the next day with the phat cream on my belly and abdominal area. It was way more drenched on the second day when i put the cream on!!! Every day you wait is another day that your stubborn fat is staring you in the face. All that work in the gym and the precise dieting still won't get rid of that stubborn fat. You can avoid expensive cosmetic surgeries when you use PHAT cream. You'll accelerate your results because it is developed specifically to get rid of stubborn fat areas. No longer will you get frustrated when you look in the mirror after a hard workout and still see that stubborn fat. You'll have all your friends coming up to you and asking what you did to look so amazing. When you achieve the same results as our happy customers you will feel amazing and look amazing. When you lose that stubborn fat your self-confidence will soar. A daily application of this topical cream assists your abs definition and helps create the ultimate shredded six-pack. Scientifically-formulated and heat-activated, Phat Cream provides an extra boost to any high-performance diet and exercise program... which empowers you to make the most of your muscles! So go ahead and choose how many bottles now and you'll be on your way to enjoying all the benefits we've talked about here and more! Let's get started right now! P.S. - Every minute you wait is another minute that you have to carry around that unsightly stubborn body fat. One of the best creams out there, when I apply it to my skin I immediately feel it working. I use it with a wrap and the effects are better. 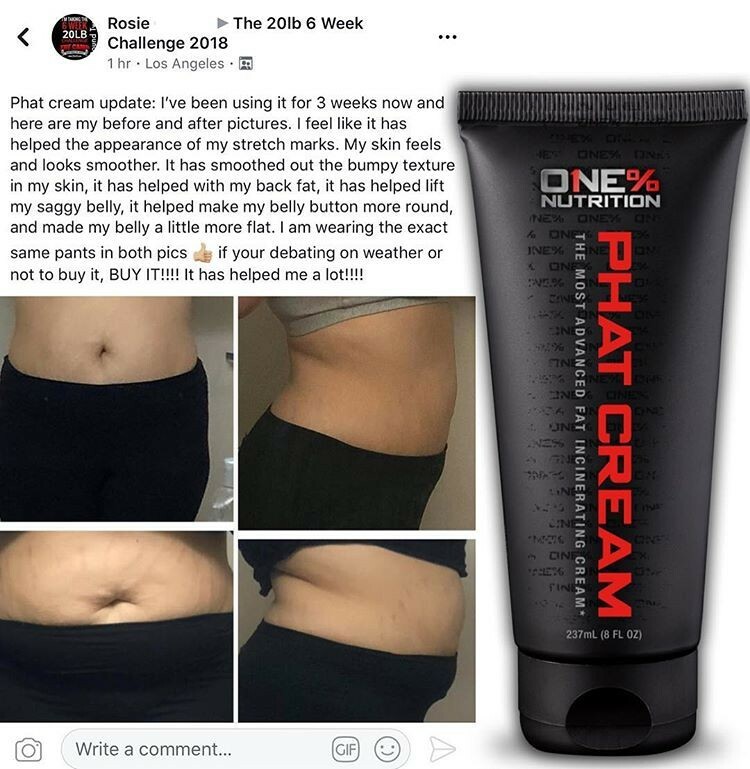 I've been using Phat Cream for just under two weeks with my current fitness plan. Once I assess my two week progress using the Cream I will call it like I see it. I was first introduced to the PHAT CREAM when I joined The Camp Transformeation gym. I instantly fell in love with it. For once, a description was accurate! I started seeing results within a few days.